Editor’s note: This is part four in a series of stories examining J-1 student visa workers on the Kenai Peninsula. Photos courtesy of Tom and Adelle Bearup. Linn, at left, and Isabell, at right, staying with Tom and Adelle Bearup, of Soldotna, have a glamor dress-up slumber party with friends Christine, Micki and Victoria this summer. Linn and Isabell worked at Taco Bell in Soldotna this summer, while their friends worked at Subway in Kenai. 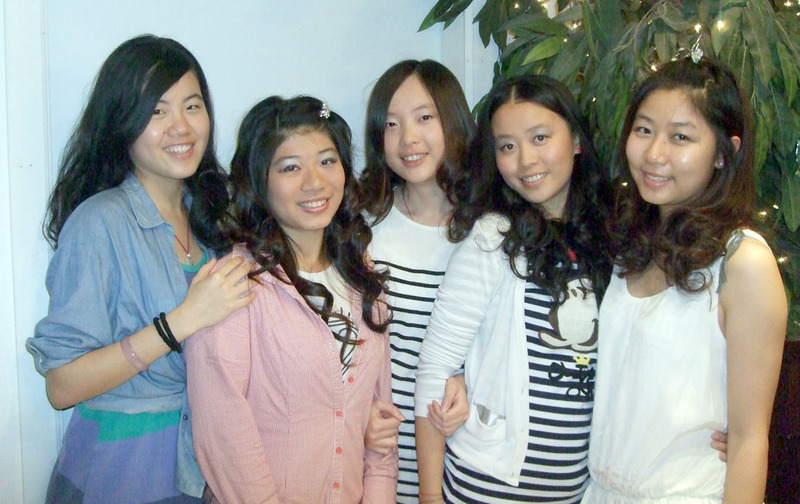 The girls, from China, had never had a dress-up party before. Once parental protectiveness tendencies kick in, it’s hard to hold them back. That’s what several central Kenai Peninsula families have found as they stepped in to help international exchange youth in the U.S. for the summer on J-1 cultural exchange visas. The college students pay thousands of dollars to exchange sponsor programs to spend three months working, traveling and experiencing American culture in the U.S. Instead of the life-enriching, educational and enjoyable experience they seek, they often find themselves adrift in the areas to which they are sent, challenged by language and cultural barriers, unused to the climate and way of life in communities much different than their homes, unprepared for the difficulties of living on minimum wages, and without much assistance from the exchange sponsor agencies that are paid to arrange the trips. On the central Kenai Peninsula, students come from Turkey, Kazakhstan, China and elsewhere. They work at fish-processing plants and fast-food restaurants. And they have been taken in by local families who worry about the students’ well-being and the impression of the U.S. that the students may form. “We’re Alaskans. We love people. We care about people. We want to reach out to them and want to help where we can. We want them to know American people are giving, loving people, and they open their homes and their hearts to people they don’t even know. We want them to see that,” said Tom Bearup, of Soldotna. Bearup and his wife, Adelle, took in five Chinese women placed in Soldotna last summer by Spirit Cultural Exchange to work at Taco Bell, and took in two this year. In offering to house the international students, the Bearups, like several other families in the area, have found themselves fulfilling many roles for their summer guests — putting a roof over their heads, food in their mouths and more Alaska-appropriate shoes and clothing on their feet and backs; providing transportation to and from their jobs; being tour guides and translators to heighten their cultural experience; and being a resource in smoothing out the inevitable hiccups they encounter — helping cash checks, book travel arrangements, straighten out paperwork, etc. In some situations they find themselves going beyond being hosts, chauffeurs or travel guides to acting more like protective parents, and wondering just where that line should be. These are adults, after all — legally old enough to make their own decisions and be accountable for the outcomes. And the hosts didn’t apply for the position, nor are they paid by the exchange program sponsor organizations to look after the students. But once they’ve opened their homes, the families often open their hearts, as well. The Bearups are used to being protective. They’ve got nine kids and 31 grandkids themselves. Bearup is a pastor, a former mayor of Soldotna and has worked in law enforcement. They’ve run a daycare out of their home, and have even considered starting a Christian-based international exchange program for disadvantaged Korean youth wanting to better their lives by attending school in the U.S.
As Bearup puts it, Adelle never knows who he is going to bring home to dinner. So when he heard about the Chinese women working at Taco Bell and living at Kenai Landing last summer, inviting them over for a meal, and then to stay the rest of the summer, wasn’t that out of character for the family. Linn and Isabell celebrate their 19th birthdays with the Bearups this summer. hotel like Kenai Landing or something like that. They provide the (housing) service, but there’s not really any growth, there’s not a lot of educational or cultural stuff going on out there,” he said. The students were paying $20 a night to stay at Kenai Landing, plus paying for food and other living expenses, and cab rides or some other transportation to get back and forth to work, Bearup said. “The company (Spirit) is not preparing them for Alaska. They have no concept of what is Kenai or what is Soldotna. … They (the students) come here with an expectation of making money and it’s not happening. They come here on a minimum-wage job and have this vision of America being wealthy and no matter where you go everybody’s got gold. They think that working at Taco Bell for minimum wage they’re going to be able to work for three months then be able to go travel around the United States with that little bit of money,” Bearup said. Spirit is headquartered in Illinois. There are about 60 sponsor organizations accredited with the U.S. State Department to arrange J-1 student cultural exchange visits. According to the State Department, there are 4,415 summer work travel participants in Alaska this year, most often working in fish-processing and fast-food jobs. Of the programs that send students to the Kenai-Soldotna area, none have local representatives. Students, their employers and the families that volunteer to house the students can call or send emails to the sponsor companies, but don’t deal with anyone in Alaska, much less anyone who knows about life on the Kenai Peninsula — the cost of living, the lack of public transportation and affordable, temporary housing, the distance from Anchorage and the cost of traveling there. Students are unprepared for those functional realities, and adapt to them with varying degrees of efficiency and maturity. People are different, cultures are different and some students are more self-sufficient than others. The five women the Bearups housed last year were juniors in college and were more mature than the just-graduated-high-school students the Bearups took in this year, he said. “They knew how to save their money, clean their rooms, take care of things,” Adelle said. The freshmen, on the other hand, are closer to being kids than adults. In China, where families only have one child, that can mean a somewhat startling lack of experience, by U.S. standards, in caring for themselves. The Bearups have tried to create an enriching educational experience for their guests. They hold daily exercise sessions, conduct English classes, take them to see cultural and historic sights, organize fishing and other outdoors excursions, introduce them to local residents, host sleepovers for other international students, discuss U.S. and Alaska culture, history and government, and Adelle has taught them to cook and helped them create their own cookbooks to take back home. 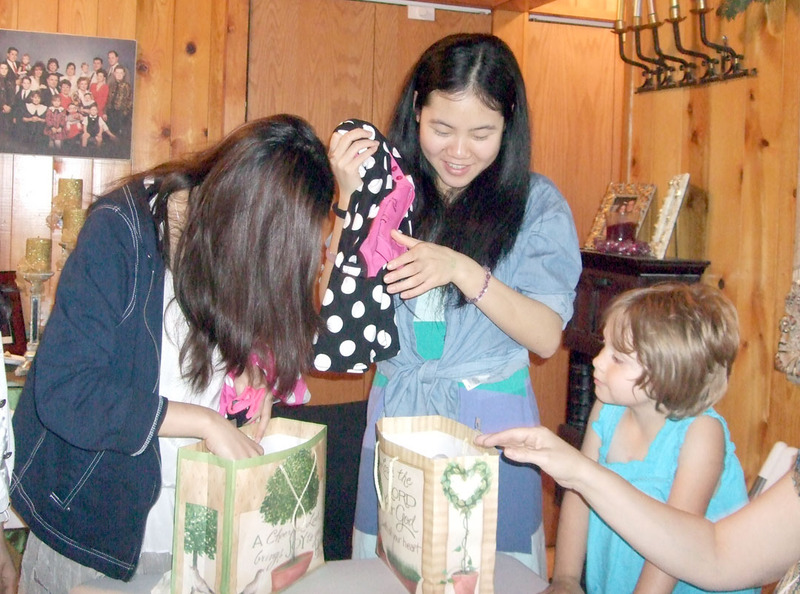 Isabell, left, and Linn, center, open presents at a party thrown by Tom and Adelle Bearup, of Soldotna, celebrating the girls’ birthday, while the Bearups’ granddaughter, Aubree Schneider, at right, watches. The students pay $10 a day to help with expenses, and the Bearups give them a place to stay, two to three meals a day, transportation to and from work, and help with whatever else is needed. The Bearups get the sense that the Chinese students they’ve taken in aren’t necessarily from poor families — they are able to afford the $3,000 fee Spirit charges to participate in the J-1 program, as well as pay the travel costs to and from the U.S. The students talk with their parents regularly over Skype, and their families send money if a need arises — like to buy a cell phone. But Bearup said that it doesn’t seem like the students or their parents have a good idea of the cost of living in Soldotna. “I don’t think they’re so financially strapped, but I think they’re sold an idea that they’re coming here and I don’t think they realize the extent it will cost. Someone has to tell them, to find out what it costs to go to a certain state, like Alaska — this is what it costs for housing here in the summer, this is the cost for food —versus staying in Arizona,” Adelle said. Is that the responsibility of the sponsor organization, such as Spirit Cultural Exchange? Or the students? Or their parents? If it was one of his kids, Bearup said he would make sure he knew such things. “I think the parents need to be more proactive and involved, but I say that self-consciously because I don’t know how much they are involved. If it was my child going halfway around the world, I would know where they’re going to be, who they’re going to be with, I would know how much it’s going to cost and set a budget for them to make sure that they have food, make sure they’re not in danger in any fashion,” he said. He and Adelle put themselves in the parents’ shoes. They stay up until 2 or 3 in the morning to talk to the parents on Skype to reassure them the students are safe and cared for. They’ve arranged places for the students to stay, and tour groups and emergency contacts for when they travel outside of Soldotna before heading home to China. “If my child went halfway around the world to a foreign country, if I could place them with somebody who is going to be responsible and could help them, it would make me feel a whole lot better. So that’s why we opened our home and our hearts to these girls. We just love them like our own kids,” Bearup said. Occasionally, the Bearups have to remind themselves they aren’t these students’ parents. “Our issue is, where is the line for us? These are adult women. They’re over 18. Can we or should we, from a parental point of view, be trying to protect them? It’s a fine line,” he said. The Chinese students don’t seem as experienced about some things as U.S. women their age would be, Bearup said, like partying and social interactions, for instance. 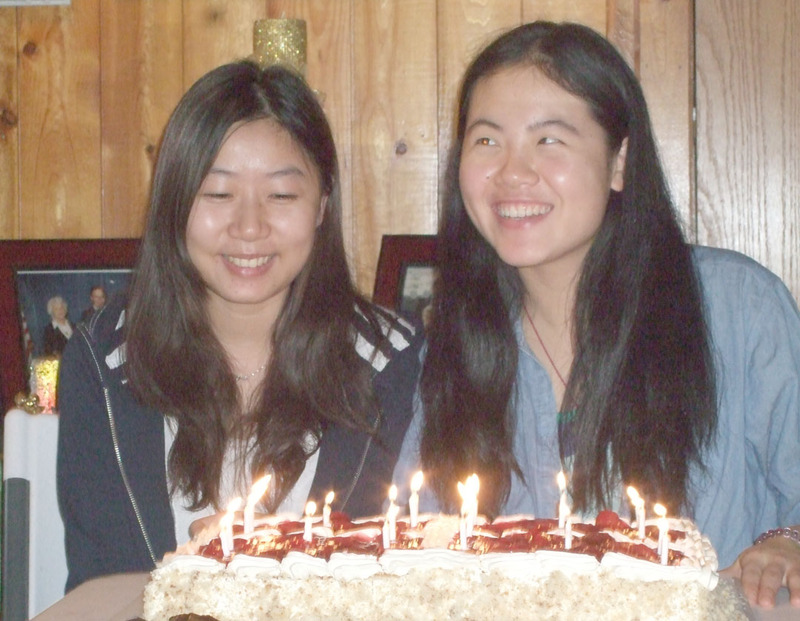 With as many kids and grandkids as the Bearups have, they hold regular birthday parties and include the international students. But then the students get invited to entirely different sorts of parties through co-workers or other people their own age they meet. “They seem kind of naive to the smoking and drinking and partying. And they’re not used to dating. The girls don’t always seem as mature as some of our girls would be here in the States. It really is not our business, they’re adult kids. But they tell us about some of the parties and some of the things going on that we would not want our own kids to be involved in. Those are temptations that they don’t have over there (in China), necessarily,” Bearup said. They’ve set some house rules — no smoking or drinking at the house, no boys coming over, no coming in at 4 a.m.
“We had to set them down and say, ‘You’ve got to be careful who you get in a car with, where you’re going to go and if there’s drinking,’ stuff like that. If they’re drinking, that’s their business, but don’t drink and drive home. I’ll come get you. I couldn’t imagine having to tell a parent in China that their kid was killed,” he said. It’s extra work, it’s extra cost, it’s extra stress caring for these students, none of which the Bearups purposefully signed up for. But at the same time, the students have also met extra love in their lives. Overall, they think the J-1 program could be a good one for all involved, if there was some extra effort made to make sure the participants were adequately prepared and supported for the experience. I’ve heard of J-1 workers being sent to Dillingham. I was kind of shocked. If Soldotna seems to far to be sending these kids, what must the experience in Dillingham be like for them?